Show Off With This Beautiful Apple Green Three-Seat Wicker Sofa! If you often have people over to your house, it helps to have the appropriate features to help them feel comfortable. It is even more important if you have a pool or live near the lake or ocean. This is why a Riviera Outdoor Wicker Sofa is needed. It is stylish and decorative. This sofa literally fits in a variety of situations, whether it is a sunroom or an outdoor patio. When you are looking for this type of patio furniture, you generally want something that is affordable. There are people who say that this sofa is an economical solution for those who desire upscale furniture, which means you are getting more for your money. Another nice thing about this beautiful outdoor Sofa is that it is made from all-weather material. The body is created from Cycroplene, which is a synthetic resin wicker. This is woven together with powder-coated, rust-resistant aluminum frames. The Cycroplene is considered moisture- and weather-resistant, 100 percent recyclable and low maintenance. The legs have adjustable levelers that can handle a variety of uneven surfaces. The seating areas are bolted together for extra sturdiness and support. Even better, the cushion has been created to be fade-resistant, stain-resistant, and water-repellent, so it needs little maintenance. 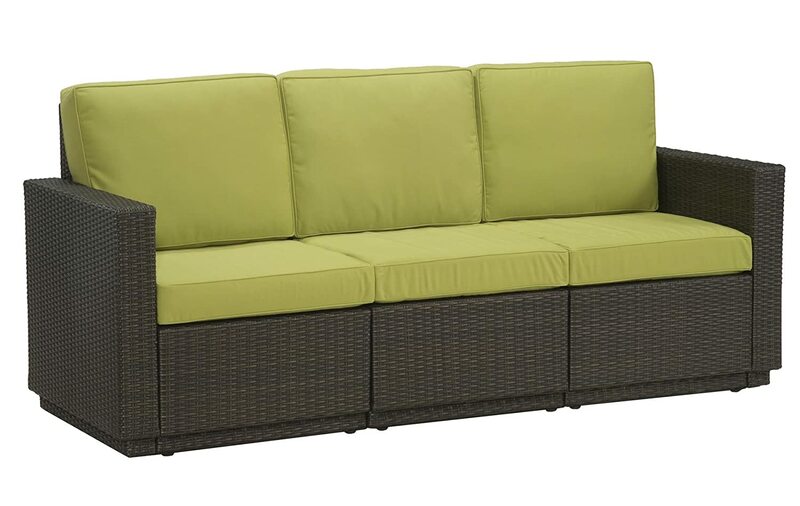 The Stylish apple green Riviera Three-Seat Sofa is definitely something to showcase on your patio.